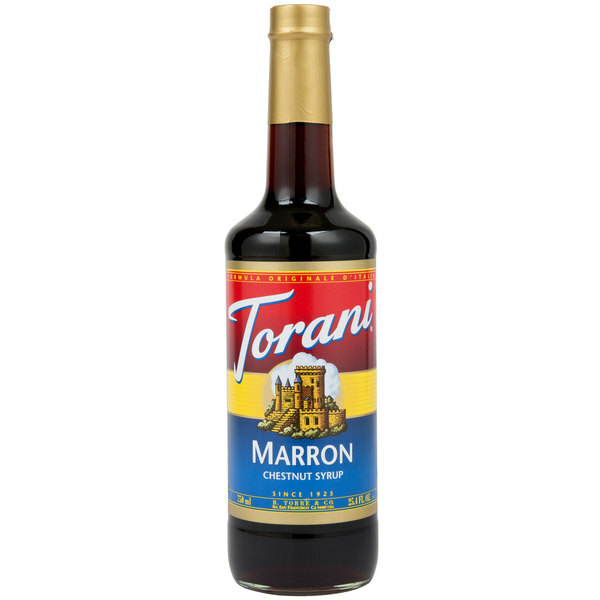 Bring all new flavors to your specialty drink menu with this Torani marron (chestnut) flavoring syrup! This tempting flavor will complement your beverages without overpowering them or being too sweet, while the user-friendly bottle will be convenient for your busy baristas to use. Torani flavoring syrups are specially formulated to resist curdling in milk and to hold up well under heat, making them the perfect choice for espresso-based drinks, brewed coffee or tea, and more. Use this flavor for frappes, iced coffees, smoothies, and even baking! Warm up by the fire and experience the warm, freshly-roasted flavor that marron syrup adds to any beverage. This syrup treats your patrons to the taste of sugar glazed chestnuts, a popular French confection known as marron glace. Discover new Torani recipes for this flavoring syrup, including a chocolate chestnut mousse mocha, roasted chestnut cappuccino, chestnut praline latte, banana nut frappe, and nutcracker cocoa! 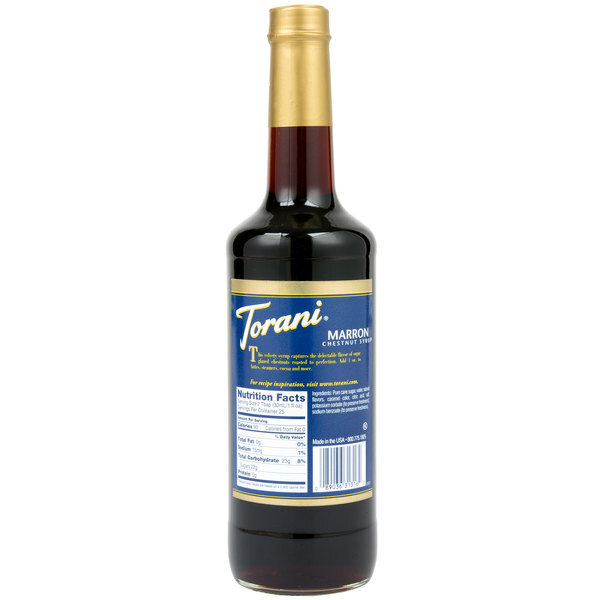 Founded in 1925, Torani started as a family company in southern San Francisco and has since grown to an international brand of quality syrups exporting to 40 countries around the world. Their sense of tradition and experimental ambition have expanded their product line to dozens of varied flavors, including the Classic Caramel and the unique Chicken 'N Waffles, yielding a flavor for almost every palate and recipe. I can't bring myself to like it very much. It tastes fine, but only as a subtle additive to cocktails. It doesn't taste too much like chestnut and it does have a rather artificial taste. However, a dash of it should add a bit of earthiness to the drink. Too much, and you'll ruin it. We have enjoyed this syrup flavor. Unfortunately I haven't found a to die for combination to really make this drink a thing. I'm going to keep trying but so far not much luck. We use this Torani 750 mL Marron (Chestnut) Flavoring Syrup in our specialty coffee beverages. It tastes great and our customers like it. It can also be mixed with other Torani syrups to make unique drinks. The chestnut flavoring syrup is hard to find but a really good find. It is great to have this flavor around Christmas and has a really good nutty flavor. Perfect for coffee. This flavor is interesting but will be ordering more. It is a nutty flavor given the chestnut but also a little bit bitey. It's kind of a dark syrupy flavor, good alone or with others. Its good but not strong enough. Wish there was other good products out there with a stronger flavor. It was good but we had add extra pumps to get the desired flavor. We love almost all the Torani syrups! They pour well, taste good, blend into drinks well, and are DELICIOUS! Put them in tea, coffee, Italian sodas - whatever you like, it doesn't matter, they are great. We wouldn't use any other kind! This particular flavor is not our favorite, it has a weird aftertaste and doesn't really taste like Chestnut.